As mentioned previously, we are currently taking a course in digital design at the University of Washington. Winter Quarter focused on parametric design, a process where a set of changeable parameters is established to influence a design framework. The program we are using is Grasshopper, which works with Rhino to make parametric models. This ability to establish a system of design rules and then make variations allows us to experiment with ideas further and faster. 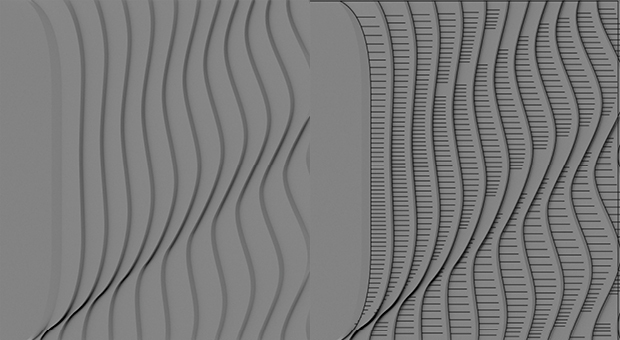 This post will demonstrate how our design process is aided by parametric design. 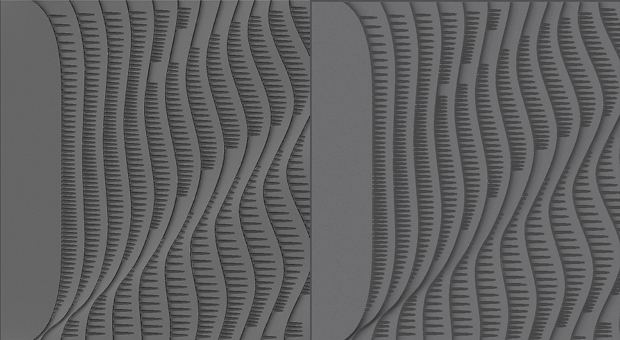 The following steps will show how we developed a pattern for a set of concrete walls. We started with the established design vocabulary of the project: an aerodynamic fin shape. Our concept is built around the movement of wind and this needed to be shown in the wall patterning. Using the tools in our modeling program we were able to create a series of curves that take our fin shape and introduce a rippling movement. These curves were then translated into formed surfaces designed to interact with the changing light through the day. After deciding on a set of surfaces that worked best we started to explore the ideas of texture and mark making. Adding textures to a surface is a difficult process; they have to reinforce the original concept without dominating the total pattern. Our process is not entirely digital and moving between the computer and the hand drawn is intensely valuable. We were able to get an idea for the patterning that reinforced the concept by drawing a series of undulating lines across the surface. Analyzing the hand drawn lines gave us a system of rules that we could apply to our parametric model. The lines would be spaced further apart where the surfaces were wider. We then modeled this system in Grasshopper and, after tweaking the parameters, came across a pattern we liked. Refining the pattern further and reintroducing it into Grasshopper allowed us to get even more control over the design. In the end we were able to achieve a successful design by knowing when to use which tool and how to navigate between them.